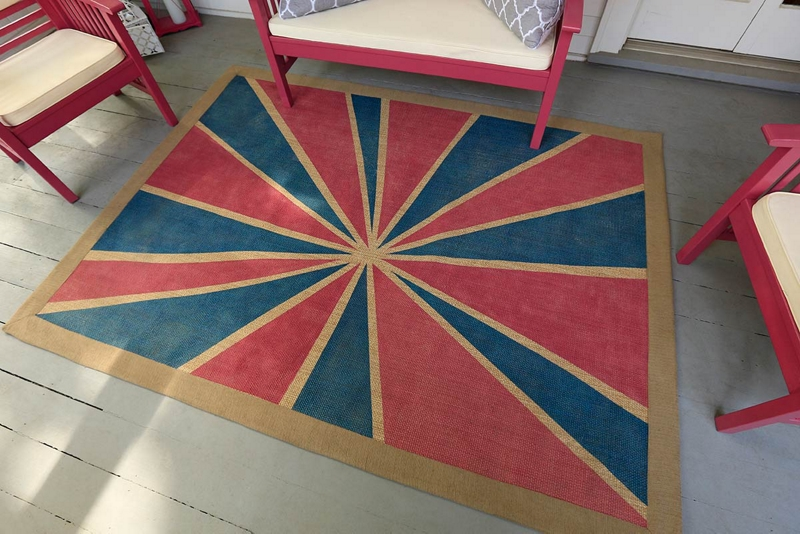 Make an ordinary rug extraordinary with Krylon® ColorMaster™ Paint + Primer and an eye-catching starburst design. Create a border along the outside edge of rug using painter's tape. Create a starburst pattern using tape and craft paper or cardboard as masking to protect areas you do not want painted. Applying in a well-ventilated area, hold can of Krylon® ColorMaster™ Paint + Primer - Gloss Raspberry 6-8 inches from the surface and spray using a sweeping side-to-side motion with slight overlap. Allow paint to dry for at least 10 minutes. Cover painted starburst pattern with craft paper or cardboard. Expose unpainted area and repeat steps 5 and 6 using Krylon® ColorMaster™ Paint + Primer - Gloss True Blue. Allow paint to dry 10 minutes before removing craft paper and tape.